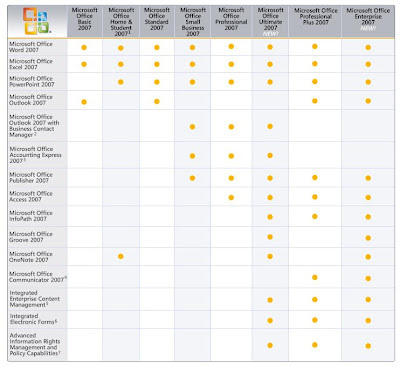 MPECS Inc. Blog: Office 2007 Suite Grid - What is in what again? It is a perennial question that all I.T. professionals get: "What is in what version of Office please?" The original grid can be found here: 2007 Microsoft Office System suites. Note that the step from Small Business Edition to Professional Edition is Microsoft Access. Since those are the most popular non-licensing versions we deal with, that is a good thing to remember. Also, when selling OEM versions, we make a point of informing our clients that there is no accompanying media with OEM licenses and that it comes installed on a new system before the system leaves our shop. They can then order a copy of the media via a Web link in the license case for a small shipping fee. Here is a link to our previous blog post on Windows Vista's editions: Windows Vista - Now ... Just Exactly What is in What Edition Again?! ?